With roots reaching back to April of 2000, the Mario Abney Quintet (nicknamed “MAQ5”) was started just outside Dayton in a small town called Wilberforce, Ohio. Dubbed by Cin Weekly as jazz workhorse, Abney has managed to perform as a sideman and leader with everyone from Erykah Badu to Wynton Marsalis. However, it is with his group’s original compositions coupled with tastefully chosen covers that he feels comfortable to truly play from the depths of his spirit. 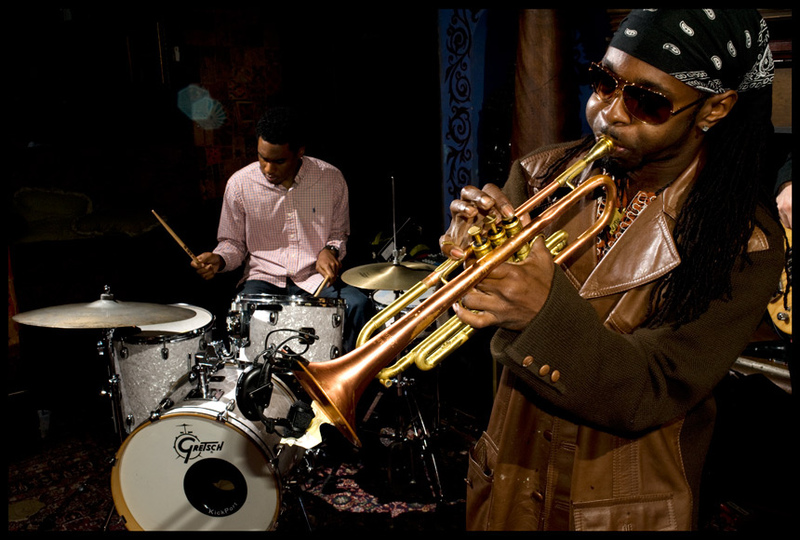 Mario is constantly propelled to the summit of his trumpet coterie by his band – The Mario Abney Quintet: Saxophonist Clarence Slaughter, keyboardist Rashon Murph, bassist Ian J. Baggette, and drummer Julian Addison. Since its inception, the group has seen some ups and downs with lineup changes but in early 2007 things began to quickly elevate. Inchoately hitting the ground running since then, the MAQ5 has managed to not only hold down weekly and monthly gigs at local historic jazz venues such as Jazz Central in Dayton, and The Greenwich in Cincinnati, but also play events spanning across major Eastern and Midwestern cities including Chicago, Atlanta, Washington DC, Indianapolis, Virginia Beach, and New Orleans. The wunderkind group has the versatility and draw to have been asked to perform at everything from late night clubs and hot spots like Kanye West’s after party, to high society galas such as the National Society of Black Law Students association’s (BLSA) national convention, or the Sigma Phi Epsilon Centennial Celebration – all while not compromising an iota of artistic integrity, and showing their desire to bridge any racial barriers with their music. With a high standard set by Abney, the band maintains the image of dressing sharp and always playing just past their perceived peaks. There have been very few groups who play their own blend of soul and progressive groove jazz with the passion and integrity of the Mario Abney Quintet. Each time they grace the bandstand whether it is the concert hall or the street corner, it is certain that they are destined to become stalwarts in the next driving force of instrumental music.